But some of the factors that could be sapping worker productivity are more subtle and insidious. One significant one that flies under the radar far too often is indoor air quality. It’s an important issue from both a residential and occupational standpoint: The Environmental Protection Agency suggests inside air may be up to five times more polluted than the air outdoors. Office environments can be particularly troublesome, as Marilyn Black of UL noted in a 2014 Huffington Post piece: Volatile organic compounds (VOCs) can arise from plentiful and varied sources, from printers and computers to paint and floor coverings, and the modern well-insulated office building, as energy-efficient as it may be, sometimes lacks in ventilation. Black suggests the issue may cost employers $15 billion every year. A polluted or inadequately ventilated workplace can result in physiological and behavioral problems for everyone involved, whether they’re conspicuous or not. Depending on the severity of the issue and a given worker’s health, symptoms can range from chronic headaches or tiredness to allergic reactions, asthma, or illness. An employee forced to miss work because of infections or allergies hampers your office, of course, but so does the less visibly affected individual who might take longer to complete tasks because of vague fatigue or a throbbing forehead. And what about the crankiness that so often arises when somebody feels energetically drained or perpetually annoyed by a relentless runny nose or cough? That unhappiness–which can spread to other people, mind you–isn’t helping matters either. 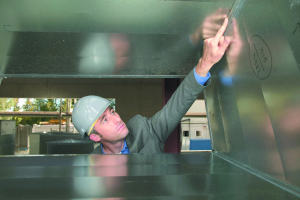 Numerous studies have suggested the link between indoor air quality and worker productivity. The Lawrence Berkeley National Laboratory’s Indoor Air Quality Scientific Findings Research Bank (IAQ-SFRB) suggests that improving indoor air quality can boost productivity upwards of 10 percent. One key to bettering your indoor air quality is keeping your heating and cooling ducts clean. Built-up deposits of dust and other debris inevitably diminish your ducts’ efficacy, which can lead to dirtier and poorly circulated air. Turn to qualified experts such as Modernistic for regular commercial air-duct cleaning. As you dutifully pursue strategies for shoring up workplace productivity, don’t neglect the caliber of that workplace’s airways. Give your workers–and yourself–the clean, fresh air you deserve to get the job done, day in and day out!